Weather you want to add color to the room or reinforce your sense of style around the house, Choosing the right area rug can be the perfect answer. 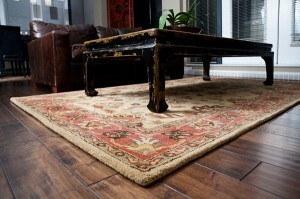 Varying from a machine made shag rug to a handmade delicate Persian wool rug, your options are almost limitless. Available to your are a wide variety of colors, patterns, materials, shapes, sizes and many more factors that contribute to a rug’s character. But as with anything else, too many options can be a tad overwhelming. That is why we have some thoughts and tips for you on the subject, as real area rug experts and enthusiasts. Measure your room properly and decide on the exact location of the intended rug. Size in this case is money, so you will need to decide on that first. With a big room, a large rug is needed, otherwise the whole space will look smaller or in the wrong proportions. On the other hand, if your sofa is backed-up against the wall – you can have a smaller rug, in front of it. At any rate, it should at least cover the length and width of your furniture. Another major factor that should be consider at first, is the style of the rug and the character it showcase. A unique item and a substantive addition to any home, it is a true testament to its owners sensitivities. The chosen rug should go hand in hand with your lifestyle. For example, buying an expensive and delicate main piece would be unfortunate if you have pets and little kids. It won’t hold or keep it’s qualities for a long time in such a household. Choosing a specific material that fits these circumstances, such as wool or a synthetic rug, would better suit you. The pattern of the rug would be another issue to consider, scaling between the minimalist bright rug to dense dark rug (on which stains would show less prominent). Remember that patterned rugs can really complement your room color scheme, and that wear and tear shows less on these rugs, in comparison to cleaner, neater rugs. Whichever rug you choose for your home, keep in mind that it is an item that – as the cliche goes – “really ties the room together”. Make sure you tie it the right way for you.